I'm combining up Miss T's monthly update for 29 months (I can't believe she will be 2 and a half next month!) 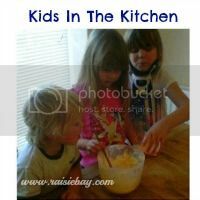 along with a quick Kids in the Kitchen. ...and a blue cake at that! They used this microwave cake recipe which is brilliant for kids as there's no oven involved (but remember things still get extremely hot in the microwave) and it's really quick. Just 4 minutes cooking time and the cake is ready. The only difference to the recipe was that they added some blue food colouring. I was so proud of them as they worked together and insisted on doing it without any grown up help at all. The only thing I did was get the mixer set up ready when they were struggling to cream the margarine and sugar together by hand. She's developed a bit of a Dr Who obsession after our visit to the Dr Who experience when we visited Cardiff on our recent road trip. Haven't published our Cardiff day yet so that is still to come on the blog. She insists that we call her Dr Who and J is a Dalek and mummy is Amy Pond. I know kids often have pretend names at this age. J used to think he was Peter Rabbit for a long while and insisted we called little brother D, 'cottontail'. But I think a Dr Who obsession at aged 2 is unusual. Particularly as she has never watched Dr Who herself. When asked if she would like X or Y (e.g. would you like a piece of cake or a piece of chocolate) she responds 'both' and reaches out with both hands and takes a piece of each. H and P (hoppy and patch), her favourite cuddly toys, have to have granola for breakfast everyday and she won't eat her breakfast until they are sat with (an empty packet) of granola. At bedtime, Daddy will whistle each night to catch our attention to go to say goodnight to Miss T. She has taken to copying that whistle with an 'eh eh ehh' sound. Hard to explain - will have to try to catch a video clip of it in future. She is hilarious at the self-checkout at Sainsbury's. When the check-out asks 'Have you swiped your Nectar card?' She replies out loud 'No'. On 1st September when we were in Bray on our road trip, we heard her count 1-10 for the first time ever. We were stunned as we hadn't taught her that and she's not yet started pre-school. And the day before she turned 29 months, on 10th September we heard her get upset at Daddy and mutter 'hate you daddy' under her breath. Again rather stunned because she's much more likely to be telling us that she loves us. I think I can guess that she may well have picked the 'hate you' up from when her two brothers storm off in a rage! But she is still utterly delightful and adorable and cute. Here she is 'sleeping' in the 'TARDIS'. I know - it is so important to note these cute little things they do down isn't it. I do love Miss T, she always makes me smile :) I have friend with a 3 yr old boy who has been Doctor Who obssed for quite a while, he even dresses up on a daily basis as Matt Smith (he hasn't moved on yet) and wears a waistcoat and bow tie. He's never seen the show either, it is a little scary sometimes, my girls hide behind the settee like I used to when my dad watched it.